Over the course of the 1970ies, the hippie-trippie artist Friedensreich Hundertwasser had built up an international reputation and slowly, even the Austrians started to like him. He had been in charge with re-developing the former Thonet-chair factory and a residential building in the third district of Landstraße, now known as the "Hundertwasserhaus" and "Kunsthaus Wien". The house was soon seen as a desirable place to live and ecologically friendly, which went well with the signs of the time: People everywhere in Austria started to developed a sense for environmental issues. In the 1980ies, groups of civil rights activists and environmentalist organisations started the Green party. And in 1987, a fire destroyed a destructor (or at least severely damaged it) - a huge factory for burning garbage. If you have every listened to a Viennese talking, you will know of the great capacity of this city to produce garbage. So the mayor Helmut Zilk ordered the reconstruction of the destructor. To emphasise how environmentally friendly the new institution would be, we wanted the nature-loving Friedensreich Hundertwasser to be in charge with the design. At first, Hundertwasser was reluctant - it sounded too much of a project of "the man" for him, as if he would be the excuse for the garbage industries of this world. Only through the support of some of Austria′s leading environmentalists, he could be convinced. The new "Müllverbrennungsanlage Spittelau" was one of the most modern destructors of Europe, equipped with state-of-the-art filter systems; it works as a destructor and caloric power plant, the fire of the garbage supporting the energy demand of Vienna. The Müllverbrennungsanlage Spittelau has the capacity to burn almost 17 tons of garbage per hour, producing some six megawatts of electricity and 60 megawatts of heat - which is directly used for the Fernwärme heating system of the city. The main tower of the facility is 126 metres high and easily recognised from many spots above Vienna. It is situated between a large station for various means of transport, the Vienna Economics University and the Bundeskriminalamt, the federal police of Austria. On the other side, there is the Donaukanal, a side-branch of the Danube. Due to the large plazas around the buidling and its "public" nature, the many students who live in this area often use the squares in front of it as recreational grounds. 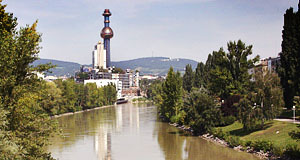 Hundertwasser has been criticised for the building; he is often seen as a "pretty-niser" of ugly or even unhealthy buildings. Nevertheless, the destructor of Spittelau has enhanced the general appeal of the entire area. Its peculiar design with colours, round, non-geometrical shapes and diverse materials impressed a Japanese politician on a state visit so much, that a 1:1 replica of it was built in Japan. The Müllverbrennungsanlage Spittelau can be seen from many viewpoints on Vienna - just read my article on "Vienna from above" for suggestions. Attractions nearby are limited - it is a neighbourhood full of residential and public, administrative buildings. The Karl-Marx-Hof is not far and Heiligenstadt has a two of the "Musikerwohnungen" that the Wien Museum runs.